Central Market Classics is the in house brand of Price Chopper, a family owned grocery store chain with stores in New York, Vermont, Connecticut, Pennsylvania, New Hampshire and Massachusetts. I'm sure this is made by somebody else, but I don't know who (yet). I picked this particular flavor for my wife since we tend to have at least one fruit based flavor in the freezer. 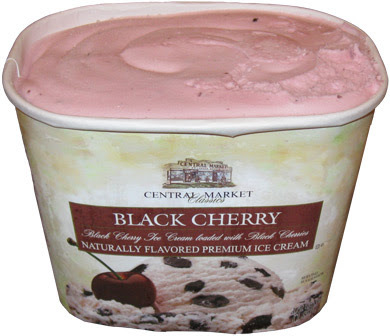 Black Cherry naturally flavored premium ice cream is Black Cherry ice cream loaded with black cherries. Sounds straight forward enough. Also note the absence of any kind of chocolate chips or anything else, it's all about the cherries. This in house budget brand is actually pretty well made. We have a fairly creamy base that tastes similar to Breyers Cherry Vanilla BUT the black cherries add a nice Dr. Pepper-like tang to the whole thing. All to often you get these nasty cheap red cherry things that just don't go down well. I mean, I don't know how you make a cherry taste cheap, but you know what I mean. My spoon isn't running in fear from any of these cherry chunks. The packaging shows numerous cherry chunks, but this is an entry level brand, so they are actually more sporadic than that. I'm not complaining, I really don't want that many chunks, but be aware that what you see isn't exactly what you get. Doing a little background check: apparently black cherries are used for a sharper taste than sweet cherries. Well, Dr. Pepper must use the same cherries because I can't stop thinking I've accidentally poured a little Dr. Pepper Syrup on my ice cream.